The Voyage Out: The King's Grave: The Discovery of Richard III's Lost Burial Place and the Clues It Holds by Philippa Langley and Michael Jones. The King's Grave: The Discovery of Richard III's Lost Burial Place and the Clues It Holds by Philippa Langley and Michael Jones. The finding of Richard III’s skeleton in a Leicester car park made news around the world. The story of the find created a huge amount of column inches in the British newspapers for many months. This is not surprising as Richard III is not only a fascinating historical figure made famous by Shakespeare, but he was also the last King of England to die in battle, the last of King of the House of York and the last of the Plantagenet dynasty. This book is a book of two halves. The chapters alternate between the hunt for Richard’s burial site in Leicester (written by Philippa Langley) and Richard’s life from his birth at Forthinghay Castle to his death at Bosworth Field, (written by Michael Jones). Philippa Langley is a member of the Richard III Society and a screenwriter while Michael Jones, a friend of Ms Langley, is a historian and author. Together they have created a captivating book that though its style will not please many historians, I believe that armchair historians and those with a fascination for all things Richard III will thoroughly enjoy the book. As we read on, the pseudo drama and tension builds until finally, of course, her phone begins to ring. Rightly or wrongly there are times where one does wonder if these events happened as written or as can occur in screenplays based on a true story, dramatic license is used. There are also times when the screenwriter has to go off on her own to walk the streets of Leicester or to sit alone in a café or by a fountain pondering the ramifications of finding Richard’s grave. When reading of these moments you can almost hear the likes of the Lighthouse Family or a George Michael ballad playing over these ‘poignant’ moments. I can forgive Ms Langley’s use of this particular style of writing as I believe it does help to make the story of the dig more accessible. It will also make the subject less daunting and dry to those who would not normally read a book based on a historical figure or even one about archaeology. Making history and archaeology more accessible can never be a bad thing. What I find harder to forgive is the intrusion of Ms Langley’s ego into the whole affair. 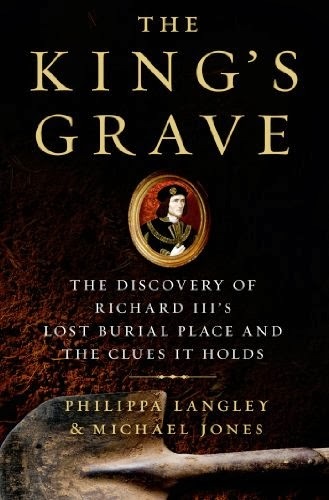 I lost count of the number of times Philippa Langley’s ‘intuition’, at where Richard was buried, is mentioned throughout the book. She continually reminds the reader that she had a psychic or instinctual feeling when she walked over the car park area some three years before the dig and knew from that moment that she had found Richard’s burial site. What put any doubts she had to rest was the large letter ‘R’ marked on the ground. (The ‘R’ referred to a reserved parking place). When the bones are found she turns to Richard Buckley, the lead archaeologist of the University of Leicester Archaeologist Services (ULAS), and says “You do know where the bones have been found”. “I tell myself I have to go with what feels right what my instinct is telling me. That has been the story of this project from the start and I’m not going to stop now”. Though Philippa Langley certainly does acknowledge and credit the help she obtained from such people as Dr John Ashdown-Hill (historian who tracked Mr Ibsen ten years previously and without whose research there would have been no search for the Plantagenet King), and Annette Carson a writer and member of the Richard III Society, it does feel at times that they are simply bit players in the leading lady’s script. However, if one can put all that aside and I did, the book is a superb read with never a dull moment and if hunger had not interrupted my reading I would never have put the book down. Philippa Langley and Michael Jones book is a resounding success and it would not surprise this reviewer if this book manages to coax the younger generation to get interested in the history of Great Britain. And one can’t say fairer than that.